Airocle’s 4 Series range of heat exhaust ventilators remove high heat loads from buildings where structural limitations do not allow for monitor or high capacity ridge ventilators. A low profile, totally weather- shielded ridge and slope ventilator, the 4 Series can be installed in multiple lengths. Designed with a high discharge coefficient, our roof ventilators have been rigorously tested and their success proven on many installations around the world. Airocle’s products use an innovative technology inspired by natural forces. Our products are environmentally-friendly and contribute to a sustainable future. 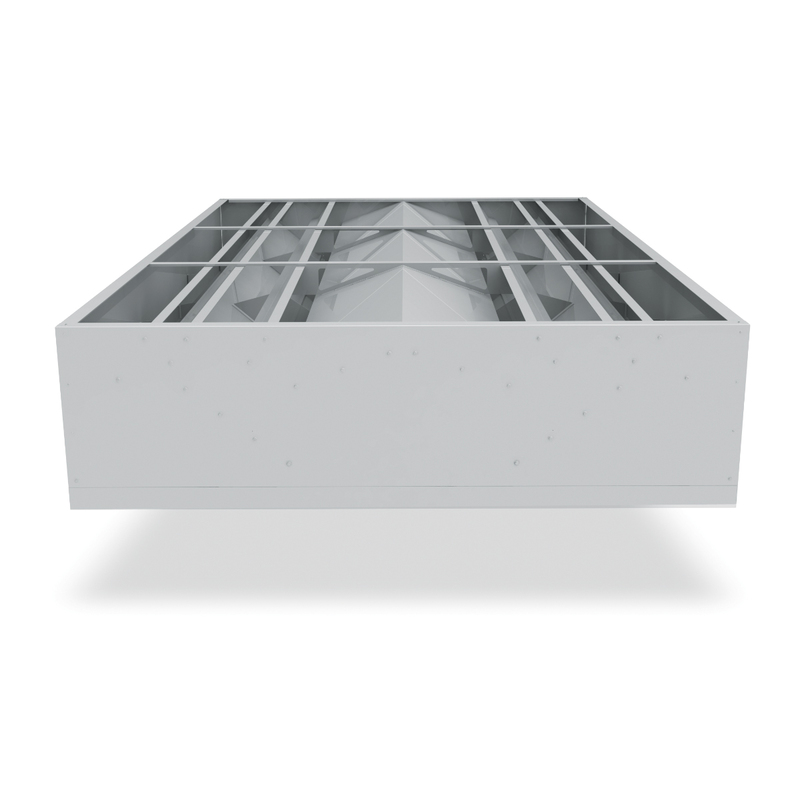 The 4 Series range is designed specifically for high heat load producing projects where low profile and high capacity natural ventilation is the logical choice. The 4 Series high flow roof ventilators are also ideally suited for lighter-weight project applications where wind and dead loading factors are an important consideration. In accordance with international weather-tightness standards, the 4 Series ventilators are performance proven in excess of 99.9% at air speeds of up to 18m/s. They are also proven for wind and snow loading to DIN 1055 Part 4 – meaning the 4 Series vents are suitable for applications over 100m high facing extreme weather conditions. The unique design of the splitter baffles and gutters of the 4 series provides each unit with a minimum 50% free opening area and exceptional coefficient of discharge. The Airocle 4 Series vents have been full-scaled tested for airflow characteristics as exhaust ventilators. With a calculated free area of 61.5% of the throat area, they offer remarkably low air flow resistance for low profile ventilators. With the option of Airocle’s ‘Phonic’ acoustic treatment to the upper roof assembly and to the vent body, the 4 Series offer exceptional acoustic performance The film-faced acoustic insulation is hydrolysis-resistant and ignition-retardant making it ideally suited for environments affected by liquids, spray or dust – including marine and tropical environments. The 4 Series vents provide quick and simple installation with all components prefabricated prior to despatch -with comprehensive assembly instructions supplied with each order. With every project being unique, Airocle has developed a flexible range of materials to suit nearly every situation. The units can be manufactured from Colorbond, Zincalume, galvanised steel, stainless steel, aluminium, copper or HP200 Plastisol. Airocle understands that the by-products extracted by each ventilation system differ. We’ve catered for this by offering a range of finishes including mill, standard Colorbond colours and ‘Vitrecoat’. Airocle’s 4 Series heat exhaust ventilators are manufactured in a standard length of 3.0m, with standard widths of 1.5m, 2.0m, 2.5m, and 3.0m. The vents can also be installed side by side or end to end depending on building layout. Lengths are able to be custom-modified, simply contact us for more information on your individual project needs. The 4 Series roof ventilators have been designed to have long maintenance free life under the most arduous of conditions. These ventilators have been engineered and tested to give maximum weather protection with the least resistance to airflow. Fully certified full scale testing combined with more than 80 years of product development and installations world-wide ensure optimum performance.